Buying A Computer Controlled Telescope? development leaves the amateur seeing lees and less of the night skies, computers can help one find the target and then move a telescope right onto that target." Above: The basic Celestron C-8 Schmidt-Cassegrain telescope with Fork Equatorial mount of 1970; weight 23 lbs. (image size 157,343 bytes). And to the right a Meade Instruments 8" LX-200 GPS Go To telescope with computerized Alt-Azimuth fork of 2003 - weight 47 lbs. (163,723 bytes). The ultimate mating of the computer nerd with the astronomy geek, computer controlled telescopes have captured more and more of the public imagination and spending. An 'astronomy robot' of sorts, they are fascinating to watch as they whirr from object to object with precision showing this and that. And when equipped with suitable optional digital cameras and other gadgets they can be told to wake at any time, move from target to target and automatically capture images of celestial wonders that could only be imagined with much larger telescopes that used film cameras. Computer controlled telescopes can help it's owner to overcome the fear of looking ridiculous while others watch; no longer will the telescope owner appear incompetent as he tries to find celestial wonders - now he only looks ridiculous as he tries to remember how to set up his telescope. We have it on good authority that there was a time when man learned the night sky and navigated the world - before computers. Newcomers to the hobby simply can not imagine what life must have been like before electronic aids to navigate the sky came along, it is as though we forgot life existed well before the hand held electronic calculator. And yet astronomy is certainly among the oldest sciences predating even the simplest devices used today such as the planishphere. There is one school of thought among astronomers that teaches the best way to learn is the 'old fashioned way' by learning the constellations, stars, hopping from one object to another. However, many coming into the hobby (and particularly those who live in suburban areas) are intimidated by the growing challenge of seeing enough stars to navigate by. Those who have this concern are among the best candidates for a computer controlled telescope. Computer controlled telescopes as they have come to be known are not much younger than personal computers. The Celestron "Compustar 14" was introduced in 1984 thus becoming the first mass produced computer controlled telescope. The Compustar 14 is a large and heavy telescope, designed for permanent installation in an observatory. By then Vixen of Japan had developed the "Sky Sensor", an economical set consisting of a Go To computer control system with motors designed to attach onto their portable "Super Polaris" series German Equatorial Mount. 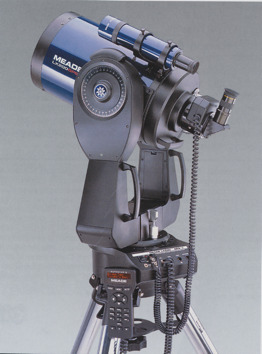 In 1992 Meade Instruments introduced the innovative LX200, a series of fork mounted catadioptric telescopes that were the first practical generation (if bug ridden and unreliable) of portable telescope. Over time these were refined to become a very capable platform, with larger models being at home as much in a college or NASA observatory as in the back yard. In August 1996 Celestron replied with the Ultima 2000 series telescopes - but they delayed shipping until 1997 when more of the bugs were worked out. The Ultima 2000 is a lightweight yet rigid and easy to use telescope. Practical computerized aids to celestial navigation (Digital Setting Circles, the Meade "CAT" system, etc.) predate the fully automated Go To systems and these continue to be economical and reliable alternatives to full blown Go To systems. When one is willing to spend something over $1,500 then they begin to enter the domain of practical and fairly accurate Go To systems. a mount, the support stand which will determine how the telescope may be used. This is usually a German or Fork mount with field tripod or pedestal/pier. the database, a catalog or list of objects in the night sky with their position coordinates. Several of the more popular catalogs are hosted at our Astronomical Database Files at our Library index page. The database may be stored in the mount or keypad of a mount, and/or the system may rely on connecting the mount to a separate computer to refer to these catalogs or refer to information beyond that provided with the basic system. "a great optical tube assembly on a mediocre mount or tripod = a poor telescope"
Computerized (or Digital) Aids to Navigation - a telescope mount with devices attached as options or built-in guiding the operator to move the telescope (usually manually) onto target. 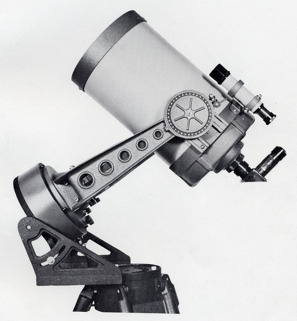 Telescopes like this are still sold today, the most successful being the Orion Intelliscope series. Go To - a telescope mount control system with the capability to automatically direct the mount slewing motors to quickly move (slew) the mount to precisely locate and center an object in the sky in the field of view of the telescope optical tube. Amateur telescopes typically slew at rates of up to 3 degrees per second taking about a minute to go from one object to another in the opposite horizon. Advanced telescopes can slew at 6 degrees per second, some up to 12 degrees per second, while some specialized systems are slewing at up to 24 degrees per second! The control systems are programmed to gradually ramp up the motors in acceleration and to decelerate gradually to reduce stresses on the mount components. Assuming the user has some understanding of the night sky and knows how to correctly initialize the system then the Go To system becomes an aid to observing or imaging, they are beneficial to those infrequent astronomers who do know or plan to learn the location of deep sky objects. These telescopes are particularly helpful for those who seek to observe the fainter hard to find objects from suburban settings where because of bright sky glow it is difficult to see reliable landmarks in the sky. Having a precision 'go to' mount can mean the difference between taking a photo of half or none of the intended target, or framing it perfectly as desired. And these systems become mandatory for operation of the telescope by remote control or for programmed automated routines. "there is nothing fully automatic about an automated telescope"
The Go To telescopes are not yet quite idiot proof since the operator must enter information into the mount control system about where it is located, the date, time. And then the set up steps may include initializing the telescope by pointing it onto one or two known stars so that the control system knows where it is starting from. More recent telescope have non-volatile memory so that all the data need not be entered every time the telescope is started. To make things easier for user some telescope mount control systems incorporate a "park" or "hibernate" mode so that after an observing session the mount will move the telescope (automatically or by the operator pushing slewing control buttons) into a low profile orientation. Having the telescope moved to a preprogrammed park position will permit the sliding roof of an observatory to close without hitting the telescope. And these modes facilitate the resumption of activities quickly on another session. Right: Tele-Station 2 Observatory with Celestron C-14 telescope with 'Go To' German Equatorial Mount on a Pier-Tech 2 elevating Pier. Telescope is in a 'hibernating' orientation as the observatory roof is closed. Observatory constructed by Company Seven Fall 2008. (123,928 bytes). Click on image to see enlarged view (298,387 bytes). These control systems may be complicated enough to set up (or "initialize") so that someone who uses the telescope infrequently may need to refer to the instruction manual just to get up and running. So to reduce the possibility of the operator becoming confused, Company Seven recommends standardizing to avoid the having to learn different control systems; if you standardize (best accomplished with German Mounts) then you need only become proficient with one operating system. Go To technology can be overkill if your needs are simple. If you wish to observe only the easier to find objects such as the Moon and Planets then a basic tracking telescope will suffice. You could set it up and have it pointed to the target while a neighbor is still trying to enter set up information on his Go To telescope. a. Closed Loop: where components installed on the telescope mount provide constant feedback of any manual or automated changes of mount pointing position to the controlling computer. 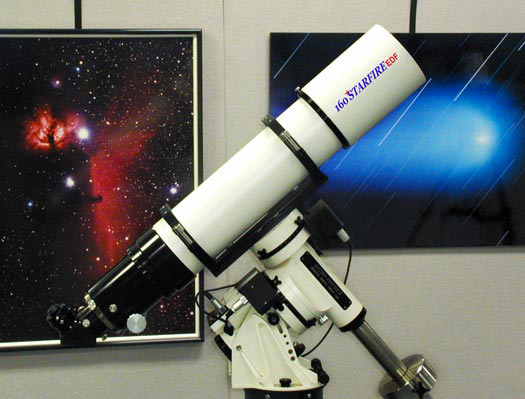 If someone uses the motor controller or manually moves the telescope across the sky, then the computer will know where the telescope has been moved to and therefore does not lose its orientation. This is a more complicated, and costly system that is rarely found in amateur telescopes. b. Open Loop: an arrangement where the telescope control system calculates the telescope direction and travel only as the electronic motors turn one way or another; the feedback to the computer comes exclusively from encoders built into the motors and as such can not determine when the telescope has been moved manually. With this mechanism a telescope must be driven exclusively by the furnished control keypad, a hand held controller, or a remotely connected personal computer. While less convenient than the Closed Loop architecture, the argument for Open Loop systems is that the motor/high resolution encoder systems of most modern Go To systems can move the telescope onto a target about as fast, and more accurately than the operator could do by hand. Most of the computer controlled Go To variety of telescopes do not provide any capability to manually move the telescope. In these systems the position can not be changed at all without use of the electronic control system because since most are open loop systems the computer will become confused losing track of its orientation to the night sky. And if there is no power, or if some sort of electronics failure occurs then these highly integrated telescope may be useless. The better Go To telescope systems have been engineered to insure the optical and mechanical components are all held precisely in place. The flexure or component shifting of the mount or optical tube are eliminated or minimized to improve positioning accuracy. But in fact, very few economical consumer grade computer control telescopes have these desirable characteristics and it shows by their modest success rate at initializing properly and finding targets in the sky. The dual tine Fork mounted Go To systems (including the Meade LX200 shown above) are usually highly integrated arrangements where the telescope optical tube can not be removed and interchanged easily with another. The requirements for pointing a high magnification system are so stringent the the critical alignment of the optical tube axis to the forks makes it impractical to remove and replace the optical tube. On some more recently developed compact mounts including the single tine Vixen Skypod alt-azimuth arrangement, then it may be a simple matter to change the telescope optical tube as may be desired when attempting a wide variety of applications. Right: Vixen Skypod showing the Star Book Type S console in its dock (66,142 bytes). Click on the image to see enlarged view (121,866 bytes). In order to have the capability to change optical tubes while maintaining a high degree of pointing accuracy we recommend German Equatorial mounts. These mounts usually offer the choice of either installing a telescope in a semi permanent bolted on fashion, or they may offer a female Dovetail Saddle with quick release male Dovetail Plate to slide a payload into place. To maintain good pointing accuracy the Saddle and Plates must be long, wide and rigid enough to prevent any flexure or the propagation of resonating vibrations. The Dovetail arrangement allows one to use the mount to support a variety of telescopes over time. So for example, on a first night out you might employ a high resolution refractor to study the Moon and Planets, while on the next night a larger "light bucket" may be put in place of the smaller refractor to permit one to better see fainter objects. Left: Astro-Physics 160mm EDF telescope on their Model 900 GTO Go To German Equatorial Mount (65,309 bytes). Click on the image to see enlarged view (103,954 bytes). Another advantage of German Mounts may be in portability. For example, a 12 inch aperture Catadioptric telescope with a Fork Mount can approach 80 lbs. in weight; since the Fork Mounts tend to prohibit easy disassembly you are stuck dragging 80 lbs. everywhere. If you mate the 12 inch optical tube onto a German Mount then the optical tube comes off with a weight of under 40 lbs. and the German mount can often be taken down into more manageable components. So for larger systems that need to be transportable Company Seven recommends German mount arrangements. The precision Go To German Equatorial mounts made by companies including Astro-Physics cost thousands of dollars but assure a lifetime of precise and reliable service, while meeting the demands of the most demanding consumer and small Colleges. In order to make intermediate consumer oriented Go To telescopes and mounts more affordable there are often compromises in rigidity and precision. One way a manufacturer can cut costs associated with precision components is by providing their telescope with both a standard and high resolution pointing mode. First, the standard mode gets the telescope near to the target. Then any slop in the system is compensated for by moving the telescope to a reference star nearby the desired target, and finally the computer is informed that the telescope is centered onto that reference star so that the distance covered from that star to the target is minimal. These telescopes may not have the accuracy demanded for advanced applications, or for remote operation, but these may be suitable for common visual and some attended imaging amateur uses. Manufacturers have developed aids to reduce resonances in the mount including vibration suppression pads (VSP's) for example and these can cut the cost and weight of a telescope mount and for many amateurs this can be a reasonable compromise. Most of the cheaper Go To telescopes aimed for sale to the novice will have so much "slop" and other problems in the components that it may be difficult if not impossible to ever find those objects listed in the provided computer database even with the aid of VSP's. In 2000 Company Seven was approached by a manufacturer who was excitedly trying to convince us to sell their new series of Go To telescopes. Their two claims to fame were: 1. retail "price points" of about $150, $250, and $350, and 2. each incorporated a 10,000 object database. When we asked him "how many of these objects can the little telescopes show?" the sales rep drew a blank. Most of the objects in the database may be stars and so if one counts the thousands of stars that may be seen naked eye with the telescope - then we suppose the manufacturer may be correct; but in fact many of the objects in these databases are simply too faint to be seen through the small telescope provided. And the mount is often too poor in rigidity and tracking precision to have any real chance of finding and photographing those objects beyond reach of the human eye. do not assume the telescope will be able to find and then show the objects." Computerized Aids to Navigation these include optional or retrofit able computer aids and are by necessity closed loop arrangements. Some of these including Digital Setting Circles made by JMI, and more recently and successfully the Orion IntelliScope Object Locator. 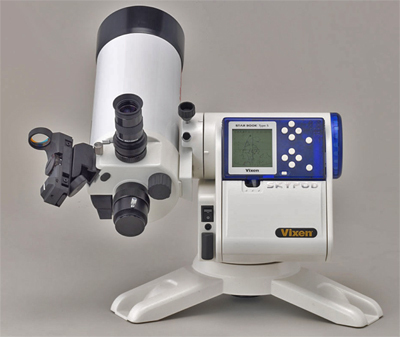 While these are marketed by others using the term "Computer Controlled", we characterize these to our customers as "aids to celestial navigation". While we disagree with the potentially misleading terms, these systems can be every bit as effective an aid to finding celestial objects when the user is directing the telescope manually (fine electronic controls can help to center an object in the field of view). The reliability of a telescope furnished with these components can be better and serviceability far simpler than that of a Go To telescope. These systems tend to be accurate enough for finding targets for visual study, but we do not consider them precise enough to center a target into the field of view of a film or CCD imaging camera. Right: Orion XT8 IntelliScope pointing to M5 Star Cluster by Bob Fuller, M8 Nebula by Coombs, and M33 Galaxy by Lorenzi. (127,639 bytes). Click on image to see enlarged view (268,752 bytes). a. Shaft Encoder: a device that monitors the direction of travel of a mount shaft, and also "counts" how far the shaft has traveled in units of measure referred to as "Tics". Two encoders are employed; one for feed back of Declination (or altitude) and another for Right Ascension (or Azimuth) motions. The encoders must be very precisely coupled the telescope mount in such a fashion that it is parallel to the mounts axes of rotation. b. Wire Harness: cable that connects the two encoders to the CPU; this cable resembles a "Y". The wire harness connectors that go into an encoder are usually a 4 pin telephone style male connector (RJ series), while the connector that goes into the CPU is a similar connector but with six or eight pins. Not all manufacturers comply with any particular wiring specification, and so the wire harness must be compatible with the CPU and encoder set. c. CPU: This information is monitored by an attached readout device referred to as a "Digital Display", or "CPU". The displays are usually powered by a common 9 volt battery. Each has a red "LED" display in a dot matrix arrangement, with a control to adjust the brightness of the display to conserve night vision and battery power. The control panel is usually two to four push buttons. - power scheme. Most operate from one common 9 volt D.C. battery. Some Digital Display devices keep the encoders constantly powered up so that if someone moves the mount rapidly across the sky, the CPU does not miss any "tic" and therefore does not loose accuracy. Most digital display devices on the market are made by one major manufacturer. Their CPU's may "pulse" the encoder on and off to conserve battery power; so if one moves a telescope rapidly the CPU may miss one or more tics as the encoder is pulsed. Therefore, one should try to move the telescope in a smooth, and fluid manner - and not quickly move it "jerking" it from one position to another. - database content*: how many objects, and how comprehensively (if) they are described (usually include RA & Decl. Size, magnitude, common name, constellation, object type). - operational/Mode features: polar alignment assistance, find/guide object, identify object, cross references to sky atlases, timer functions, user define able objects, initialization (startup and alignment/indexing) routines. count every star in the night sky up to any desired degree of brightness (magnitude), as one object in the database. If you want a guess at how many of the objects in a telescope database will be stars consider The Yale Bright Star Catalog. This is a list of potentially 'naked eye' visible stars, those stars which have a magnitude (brightness) rating of 6.5 or brighter. There are 9,110 entries in that list. How's that 10,000 object database sounding now? Incidentally, of these one can see without a telescope, even with the healthiest eyes and at a high dark sky location only one half of the sky so cut that in half to about 4,500 objects. Of these objects one can only see stars visible from their own hemisphere, so cut that in half again to 2,250. With most people living in suburban conditions, cut that down to maybe twenty percent, so generously speaking you may be able to see 450 stars naked eye from an average suburban location, probably less. From a bright city you might see only 30 stars or so. Of course, looking with a telescope will help but consider that even the smallest telescopes recommended by Company Seven for birding and nature watching, before we get into astronomical models, can show stars of magnitude 11 or fainter. count one celestial object as several objects. For example, the famous Andromeda Galaxy is also known as Messier catalog object 31 (M 31), also known as New General Catalog Number object 224 (NGC 224), it also bears an Uppsala General Catalogue of Galaxies designation UGC 454. Hence this one object, Andromeda Galaxy, may be counted as three objects in a computer controlled telescope database. Some telescopes were not originally engineered to accept these retrofits and so some ridiculous compromises may have to be made by the owner of a telescope in order to install them; in these instances we tend to recommend buying a new mount or complete telescope. The "Gee Whiz" Factor Some persons select a computerized telescope because once they have determined the largest telescope optics they can manage, they may still want for more of the novelty or entertainment value that an option such as computer may provide. While we at Company Seven tend to preach economy, we understand the "Gee Whiz" value of a computer controlled telescope. In the early 1990's the owner of C7 enjoyed the long term use of a unique prototype computer controlled mounting where the motors made a whirring sound reminiscent of a jet engine revving up and down though not as loud as a real jet. It was a sight to see such a large telescope slewing so fast from point to point. Most guys would have purchased such a system just to hear it whir along from one object to another. As it turned out that system was impractical, and as the manufacturer elected not to go into production with that system. What About After The Initial Thrill? The long term advantages of computer control are harder to define as the technology and its applications are still evolving. Over the recent years many new products have come onto the market which complement, or are complemented by the computer control telescopes including remote control temperature-compensating focus controls. Some features of computer control are highly desirable if not vital to those persons who intend to perform imaging or scientific analysis with optional electronic "CCD" imaging cameras. The popular CCD instruments (most notably those we market by Santa Barbara Instruments Group, and those by other firms) require an optional personal computer to control the camera. That personal computer may interact with a computer controlled telescope so that completely automated command sequences may be employed. For example, one could use a commercial CCD imaging software program to command a personal computer to activate the telescope at any time (even as the user sleeps! ), then move the telescope onto a target, activate the CCD camera (or release the shutter of a film camera) to capture one or a series of images, and then save the electronic images onto the personal computer hard disk for processing and analysis at a later time. This procedure is not as complicated as it sounds however, it does require precise set up effort on the part of the user. The telescope could be located in the back yard, or at a distant remote site. A user with the aid of an automated telescope can become even more involved in aspects of astronomy such as Supernova or Comet hunting that actually contribute to the discovery and research process. Make The Best Choice For You First ask yourself if you have either a justifiable need for the option of computer control, or is this just a desire for such technology? Insure you go into the commitment understanding how the features of computer controlled telescopes compare with alternative models. And understand that you are probably paying some premium, or giving up some other capability to pay for the computer control. If the telescope has he capability to show 10,000 objects, does it matter if you can now not afford to buy the accessories that may make it possible for you to observe these objects? Do not assume that a newer model is inherently a "better" telescope. Realize the view through any 8" Schmidt-Cassegrain computer controlled telescope should be the same as that view through the same 8" SC telescope optical tube assembly attached to another mount. Any of the current popular telescopes sold may be had on a variety of mounts. For example a Celestron 8" telescope may be had on a relatively lightweight mount, or in a heavier mount that may be better suited to astrophotography, or in a computer controlled fork mount. The Celestron 11" or Meade 12" SCT's may be had on a versatile German mount (the Losmandy G-11), or attached to the fork mount. A customer may be better served buying a less sophisticated telescope, and then putting the additional dollars saved into accessories (eyepieces, filters, etc.) which will improve the quality of what one does view, when the object is found. Do not overlook the fundamental, practical concerns; these include required voltage and power consumption. Be aware of how one telescope's portability compares with another; bigger is not always better if you have a bad back. Short and long term reliability issues must be considered too. Just as any new car model introduced is likely more likely to have a recallable defect, so is the case with any new telescope series especially if rushed to market. Meade Instruments suffered substantial praise and also credibility damage among those who rushed to buy the first of the LX200 series computer controlled telescopes in the early to mid 1990's. Meade has worked to "debug" the systems, and after several years or so on the market the systems have settled into what they probably should have been when first delivered. The Meade experience was not lost at Celestron where naturally as a competitor they were looking to one-up the Meade telescopes in terms of technology and quality control. 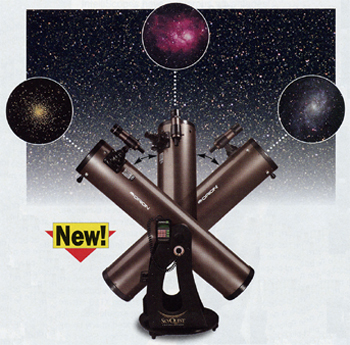 Celestron first announced the Ultima 2000 series in 1994! We read ads from mail order houses claiming "in stock" then although Celestron held off delivering until August 1997 when the systems was better perfected. Even then Company Seven found a disappointing failure rate on the Ultimas we sold over the first several years; only the prompt and unquestioning (and no charge) repair support from Celestron kept us selling the telescope as it was improved. Parts and obsolescence There are long term issues involving service ability and parts. Assuming the telescope is free of flaws and performs as desired for years consider what happens if operator error fries a circuit board? Or what if some obscure motor furnished in 1994 is not available after 2004? If your telescope or accessory requires control by a separate computer then there are similar 'technology shelf-life' concerns. Does your telescope USB port really provide the full necessary voltage output? What happens when your old computer dies and your new computer no longer can communicate with your telescope or CCD camera; do you remember the Parallel port and the SCSI port? How many PC's sold today have an ISA Card slot? A telescope that is dependent on highly integrated customized components to function, or requires an external PC may be rendered obsolete by any component failure or change of the controlling computer. "one must anticipate obsolescence and plan for an orderly transition should the time come when a critical component is no longer available"
While solid state electronics do not typically fail they are vulnerable to inadvertent shorts or power surges; for example a nearby lighting strike can emit sufficient electromagnetic pulse (EMP) to fry even the best constructed telescope electronics. In routine use the electronic motors and the mechanical gear systems (in motors and the gear sets that drive the mount) suffer from wear and tear; the good news is that telescope systems are rarely used for so many hours, and when properly operated then wear should not become an issue for some years to come. But some of the problems here involve plastic gears that may be run farther than they should - these are usually not be protected from stress by limit switches. On a less sophisticated telescope there is less to fail, and the repair of any component that may fail will probably be more easily made. And even when a "go to" mount is no longer viable then the optical tube can be removed and installed onto another mount. Be particularly cautious about retrofitable motor and computer control systems, especially those offered by third parties. A telescope mount should be designed from the ground up to deal with the stresses and loads imparted upon the gears and bearings by the rapid acceleration and deceleration cycles inherent in computer control. Simply changing motors may not address long term reliability, and may at best reduce the payload rating of the mount. In fairness to theses telescopes the concerns raised in this article could be the argument against buying anything other than a bicycle! So one must anticipate obsolescence and plan for an orderly transition should the time come when a critical part is not available for your telescope. When buying a telescope one guideline by which to measure a product can be the manufacturers warranty and service policies, these can be among the best indicators of their confidence in the product. And do not blame the manufacturer for lack of parts for ten year old telescopes, if one buys a car or a $100,000 Zeiss Microscope they can expect only eight years or so of guaranteed new parts support. On the other hand we are still servicing Questar telescopes made as far back as 1954! While Company Seven is cautiously optimistic about any new computer controlled telescope, a prudent consumer is best served when they weigh their options carefully and then wait a few months to see the reaction of the marketplace to any new technology. If you have any questions, comments, or suggestions then please feel free to contact Company Seven!